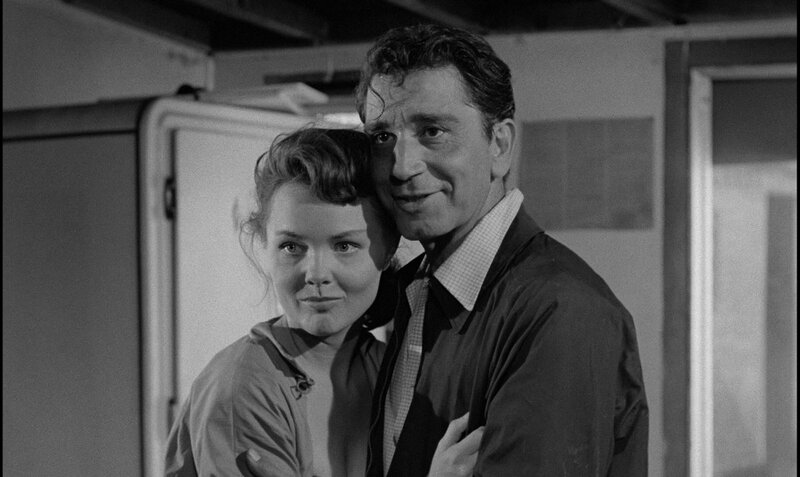 Highway Dragnet is cheap, cheesy, and started the career of one of the most prodigious filmmakers of the 20th Century. 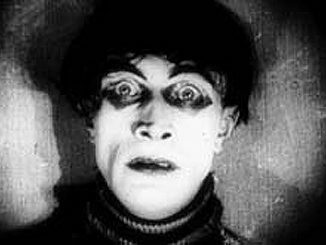 It’s rare that you can directly trace any sizable movement in cinema back to a single movie. 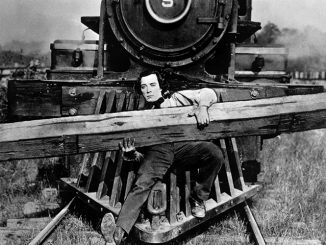 There may be the occasional watershed film where styles and themes coalesce after percolating for several years; but the number of films that can be pointed to as sole progenitors can be counted on two hands. But they do exist, and among them is an unremarkable B-movie released in 1954 by Allied Artists Pictures. 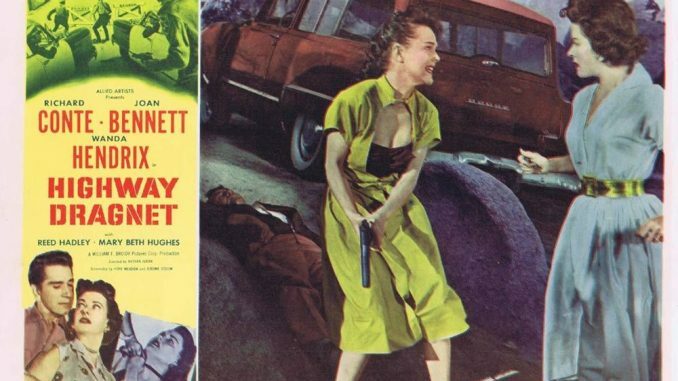 The film, Highway Dragnet, was a passable man-on-the-run thriller directed by Nathan Juran, known mostly for his camp cult classic Attack of the 50 Foot Woman (1958). The film would quickly be forgotten, disappearing into the sea of mid-50s studio schlock, not immediately significant or interesting enough to capture the attention of noir devotes and historians. And yet it turned the tide of American cinema, if not on the weight of its own merit, then for jumpstarting the career of the man who dreamed it up in the first place. His name was Roger Corman. And with the $2,000 he made on this, his first script, he partially self-financed his first independent film. And from there, the Corman empire flourished. There’s little exaggeration in saying that with no Highway Dragnet, there’d by no American International Pictures nor Poe Cycle; no Francis Ford Coppola or Martin Scorsese, no Howard nor Demme nor Cameron nor Bogdanovich nor Dante; no New Hollywood ground-breakers nor exploitation money-makers. And thanks to a new Blu-ray release by Kino Lorber, this piece of cinematic history is finally widely available for Corman fans, noir completionists, and anyone curious to see where American cinema in the 60s and 70s got its humble start. 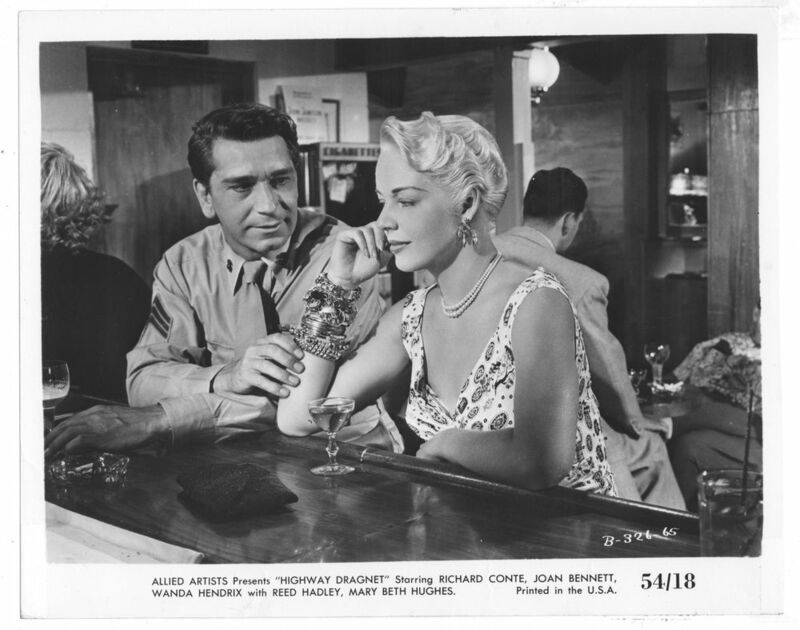 The film stars Richard Conte as James Henry, a recently discharged Korean War vet visiting his friend Paul in Las Vegas. After a tour through Las Vegas’ strip, we land in the middle of a nondescript bar where he meets a combative model named Terry (Mary Beth Hughes). They pass some deliciously pulpy dialogue—“I can make a lotta noise with a bazooka, and me and the flamethrower are real close friends”—before fading out on them kissing. Cut to the next morning with James being arrested for her murder. But there’s a problem. James didn’t go home with Terry that night; he spent the time with Paul. Only now Paul has disappeared and can’t provide an alibi. So James escapes the cops and goes on the lam. In a twist perfect for sleazy pap, he gets picked up hitchhiking by two beautiful young women: photographer Mrs. Cummings (Joan Bennett) and her model Susan (Wanda Hendrix). And so begins a great chase across the desert into California, with James concealing his identity from the increasingly suspicious ladies and the increasingly nosy state troopers. 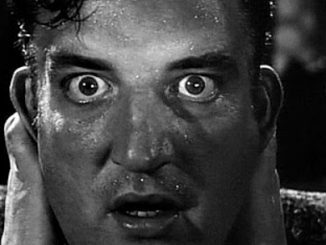 Even though Corman’s script was punched up by other writers, we can already see some of his future trademarks bleeding through: stoic, beefy leading men; the chance involvement of beautiful women; a taste for titillation—a key suspense sequence occurs in the middle of a bikini photoshoot where a dolled up Candice does her best Betty Grable. But above it all is a calculated eye for cost-effective low budget-filmmaking. As with so many Corman films, he uses stock footage and rustic outdoor environments as stand-ins for actual production value. After an opening sequence Las Vegas Strip stock footage, the film gets trapped in a procession of barebones apartment rooms, empty desert roadsides, and whatever dusty old shacks, diners, and gas stations the film crew could find on their way to California. The central image of the film—James’ half drowned house by the Salton Sea—was one Corman was so proud of he made it the name of his original screenplay draft: House in the Sea. A great filmmaker could use the desert and dilapidated buildings part of the aesthetic of the film. (See how Ridley Scott transformed the American Southwest desert in Thelma & Louise into an barren, alien environment matching the isolation felt by the fugitive protagonists.) But here they all seem incidental to a story that could have worked equally well if it was set near the Canadian border in New York. Highway Dragnet is cheap, cheesy, and relies entirely on a coincidental connection between James and the two women that would make even Charles Dickens guffaw. But it told its story and made its money. What more could a fledgling filmmaker with dreams of Hollywood glory want? It was the perfect start for a career defined by teenybopper party films, rubber suit monster flicks, and Z-grade horror. Corman turned the scrupulous business side of moviemaking into an art form, one which modern filmmakers are still grappling with, one that can be directly traced to this film.